I was going to do a post on each one like I started to do but we were hitting up so many parks that I didn't want to be posting every day for like 2 weeks only about parks. So I condensed them all to this post. 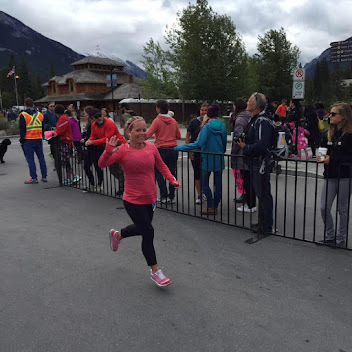 If you want to see my posts about other parks this summer, you can read them HERE and HERE. 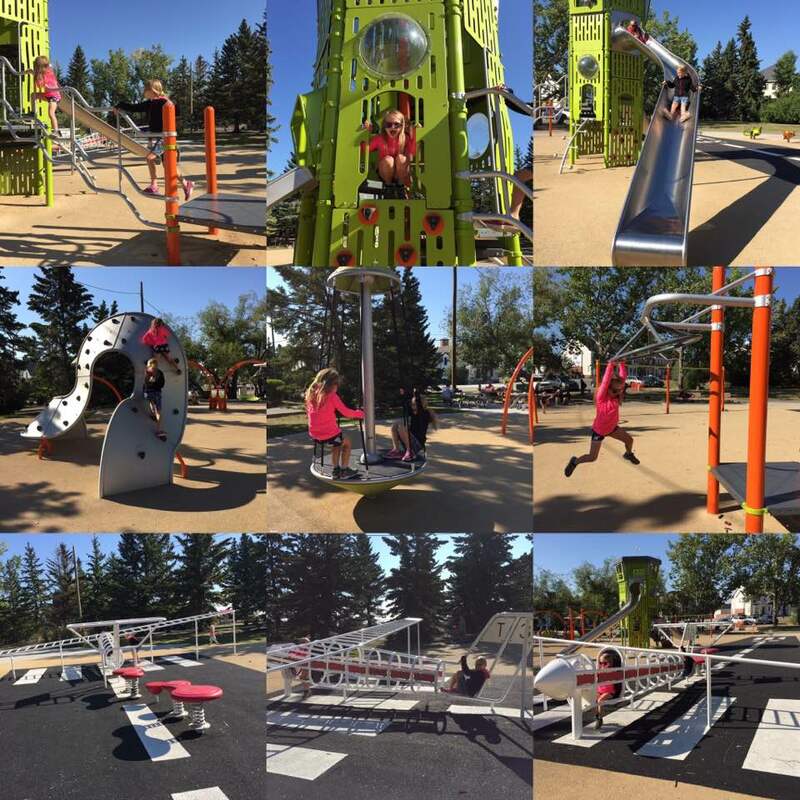 This park is located at Colonel Walker school in Inglewood at 1921 9th Ave SE. There is ample street parking and if you go in the summer like we did, you could probably park in their parking lot although I am not sure about the rules for parking there. 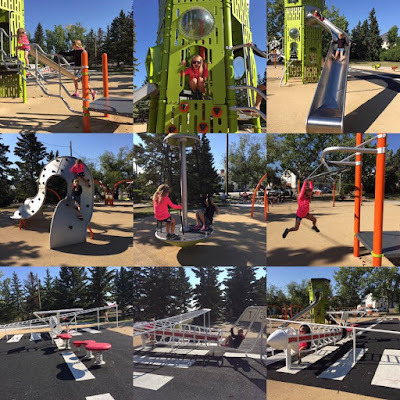 This park is fantastic and is definitely the coolest school playground in Calgary. It was a definitely what I would call an adventurer playground with ropes, slides, bridges made of rope and all other fun things. 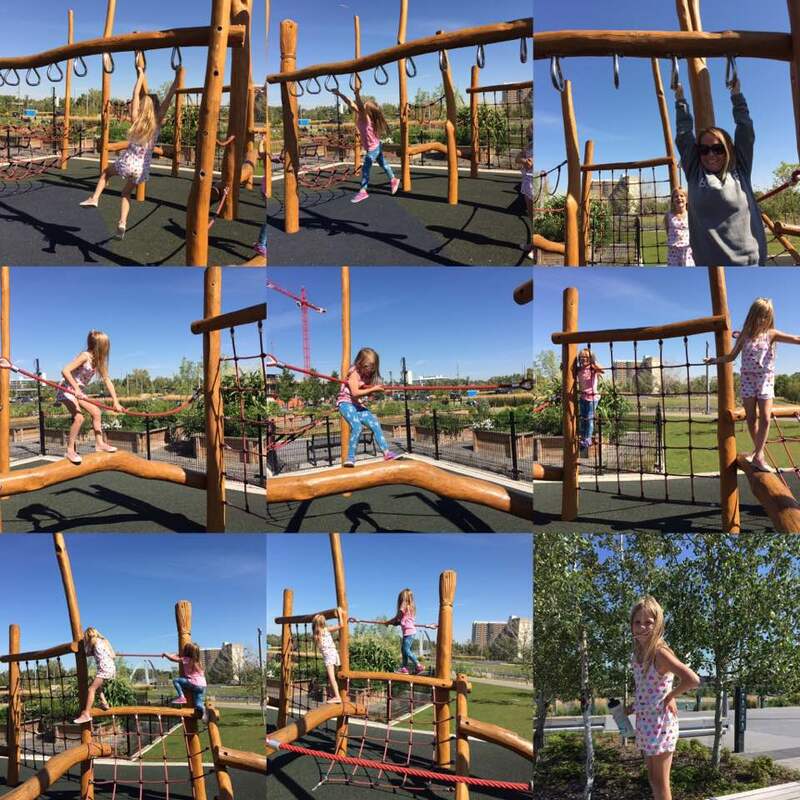 My girls loved this playground and we will definitely be back in Summer 2018. 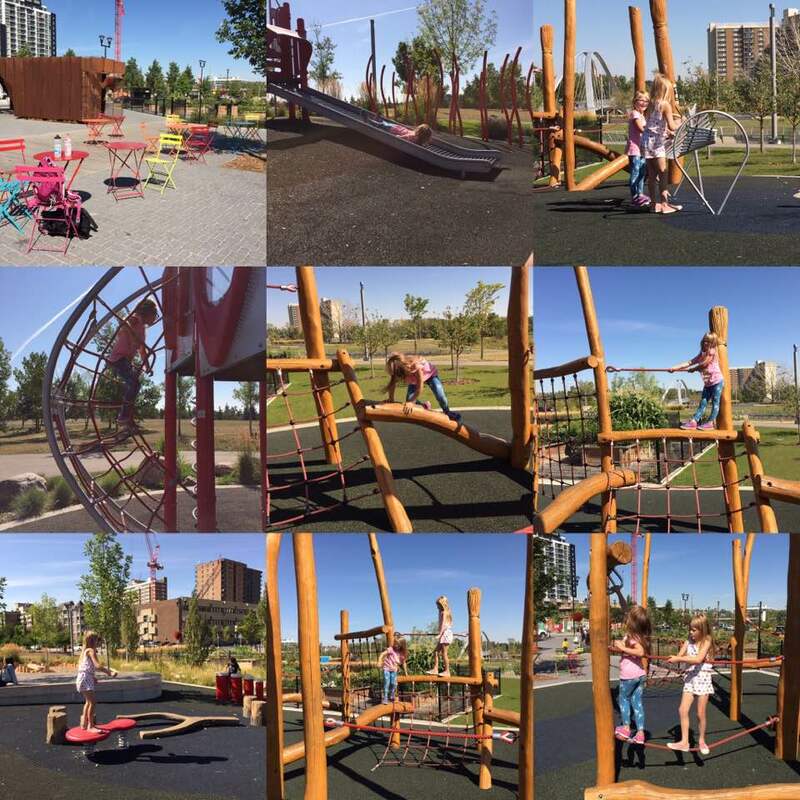 The natural playground in the East Village is one of our favourites. We tend to head this way after ice cream at Village to run off all the sweetness. 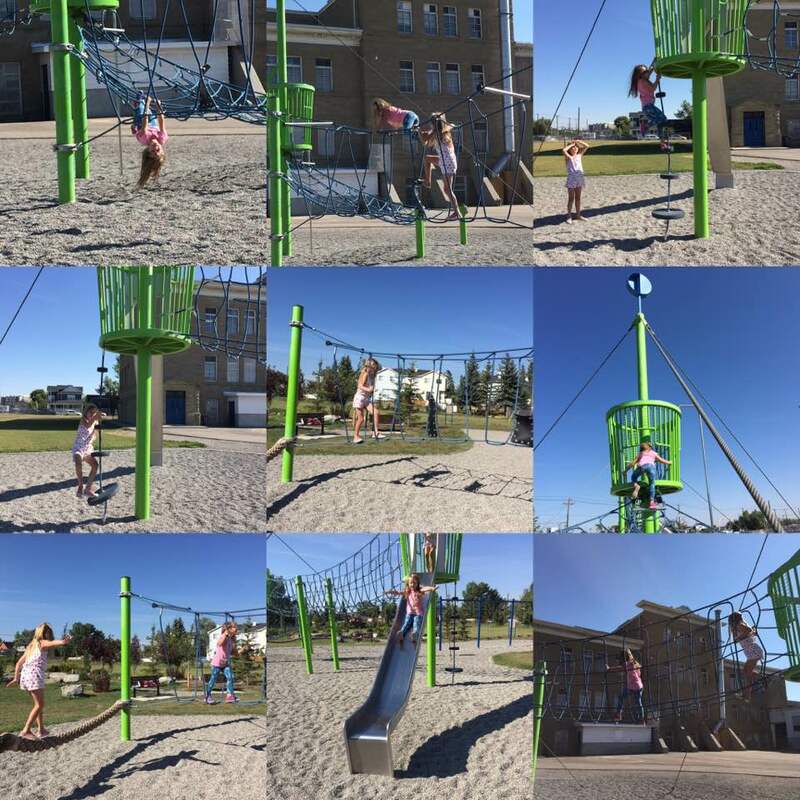 The girls really love this one and one of the nice things about this playground is that there are structures for kids of all ages. I love that it is made of natural wood and love that there is so much seating for parents to watch too. There are no bathrooms nearby unless you head to the Simmons Building. If you are willing to walk the short distance from Inglewood, there is plenty of free 2 hour street parking available. 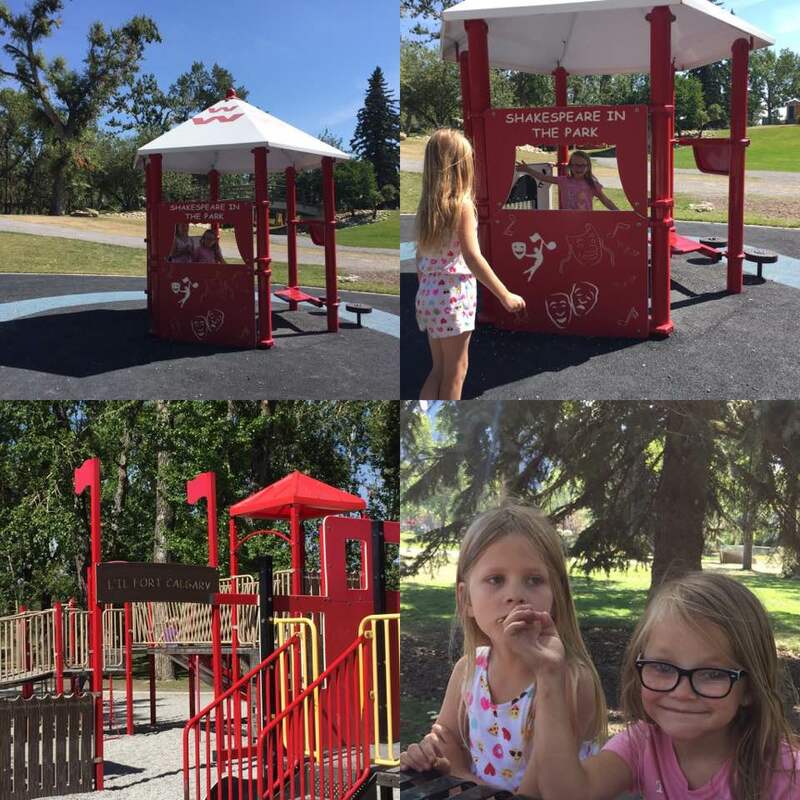 This park is located at 602-634 6th Ave SE. 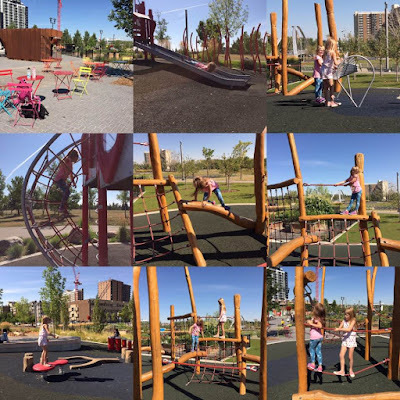 After the East Village Playground, we walked along the river front to the playground located at Prince's Island Park so we could swing on the Cowboy hat structure. It was a definite favourite. This park is huge and is very Calgary in theme. It has all kind of great mementos of some famous events in and around the park. 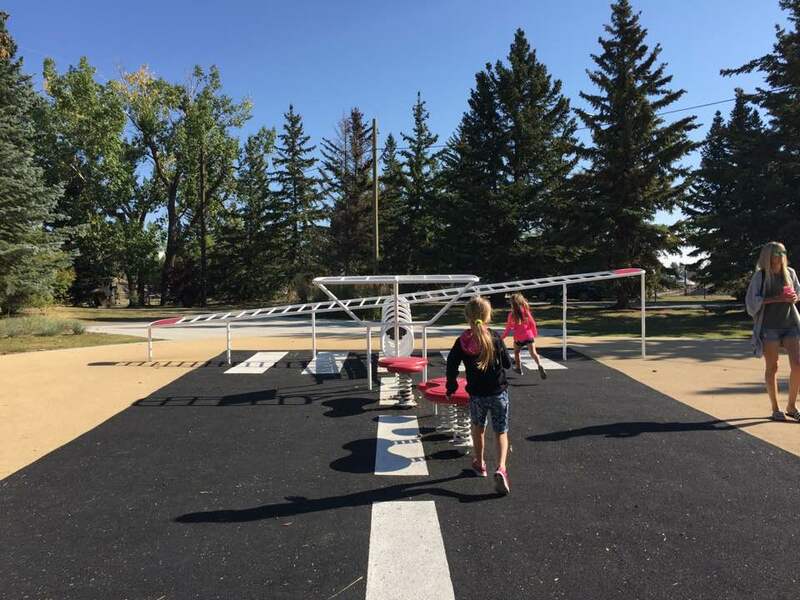 It is a huge playground with picnic tables and sections for older kids and younger kids. We had lunch here but didn't spend a whole lot of time playing since some much much older kids showed up and took over the playground portion that Finley and Penelope would have been interested in. Any by older, I mean junior high kids so really kids who shouldn't really be at the playground. Parking around here is in expensive, but we made a day of it and kept our car in Inglewood and just walked everywhere. The location is not far from Eau Clair and the address is 698 Eau Clair Ave. There is ample parking near eau clair but it is pricy especially during the day. 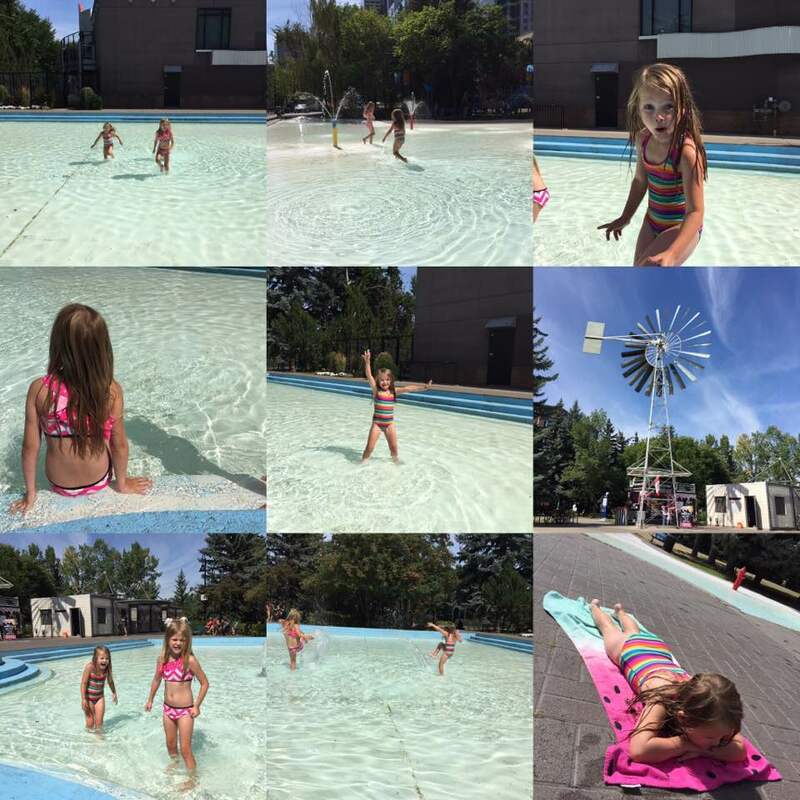 The closest bathrooms to this park that I could find were at Eau Clair Paddling Pool. After lunch, we headed to the paddling pool/spray park at Eau Clair. There are bathrooms to change in and to use if necessary. The water was freezing but the girls loved it. There is a little concession place that has soft ice cream cones, packaged ice cream snacks, chips, pop, water and gatorade. 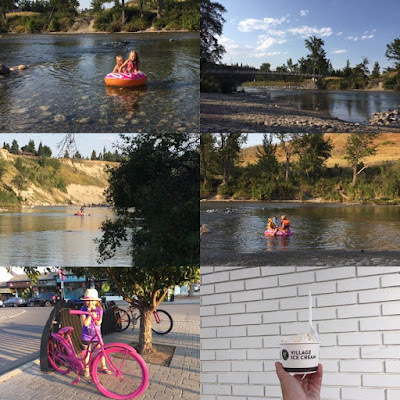 Before we left for St. Patrick's Island we had some ice cream. This park has the same address as Prince's Island Park and parking situation is the same. After Eau Clair, we walked to St. Patrick's Island and finished our park hopping afternoon playing in the water. 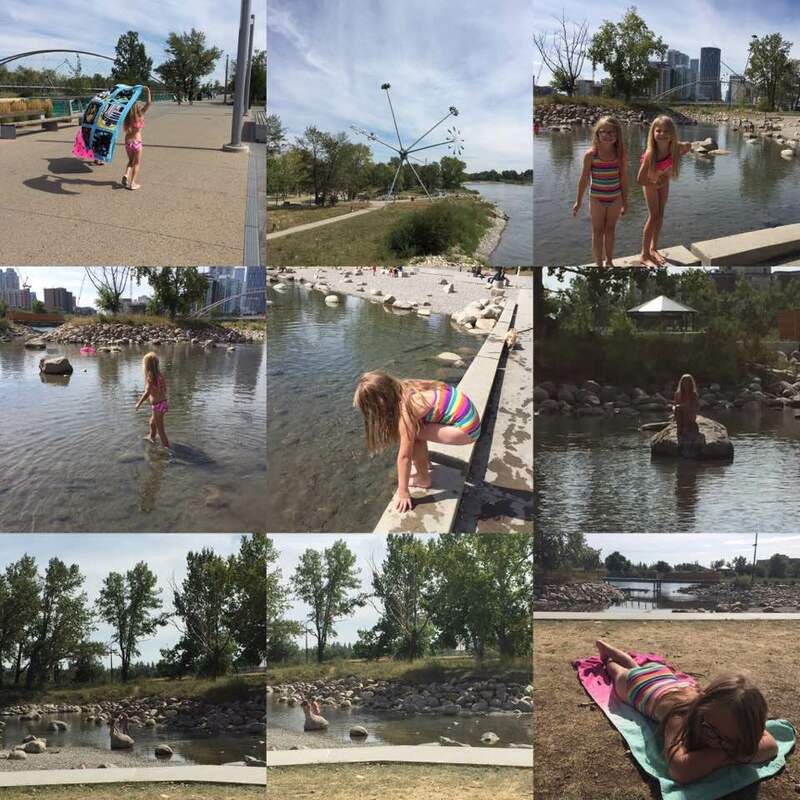 This is one of my very favourite places to visit in Calgary and we come a lot. You can park for free if you have a zoo pass in the official parking lot or you can park and walk in Inglewood like we did. By this time the kids were tired so instead of going to the playground, we walked back to the car and back home. The playground is pretty great and there are a lot of bridges to walk over and they have public washrooms too. I highly recommend checking out this place if you haven't yet. On a very hot night when we didn't want to cook or clean up, we headed to Sandy Beach Park after Greg got off work and played in the water, had a picnic lunch and then went to Village Ice Cream afterwards. Not sure why it is called Sandy Beach when the sand is few and far between haha. There is a ton of parking down the hill so don't make the mistake that I did the first time I visited and park at the top because the walk down is terrible and the walk back up is even worse. This was a great way to spend the dog days of summer. A few times we headed to Mahogany visit the Big Rock Park and it was fantastic and the kids really loved this park. 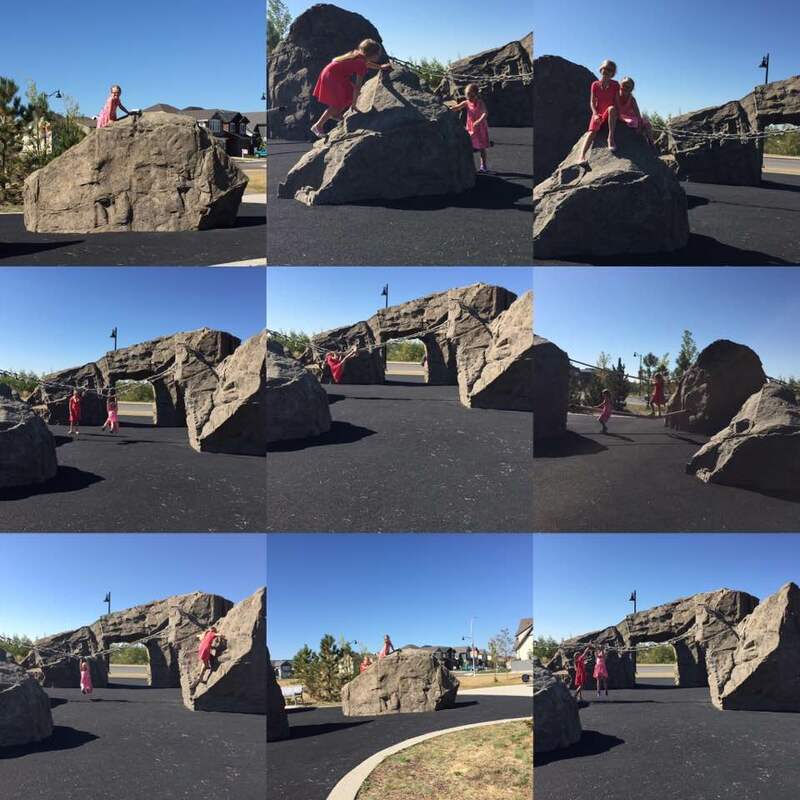 There is rock climbing and ropes to get across and on each side they have workout equipment that my kids also loved. Both times we went, we were the only ones here and so they played while I read on the benches. There are a few benches all around the park which is nice. We will definitely be making a return visit next summer. 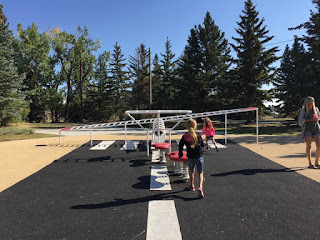 The last cool park we visited was the Airplane Park in Currie Barrocks. I got lost going there and leaving it but it was worth every extra minute trying to find it and trying to leave. It was a really busy park and parking is scarce in their parking lot and it was hard to find parking that didn't require permits. The kids loved coming here and it is another one we will return to. Are there any hidden gems of playgrounds that you have found?? 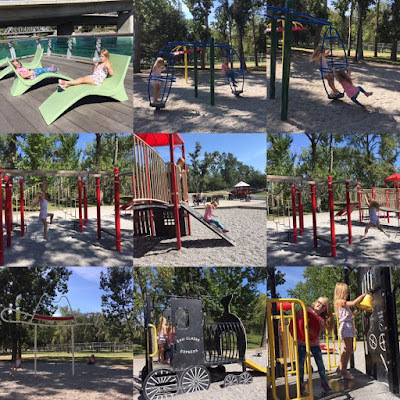 I am more interested in parks that are geared towards older kids since my kids are getting older and almost out of playground playing haha. Sandy beach is where Grady camped last week with school. There is a YMCA camp down there and I had no idea!